When shopping for the best flashlight for mechanics, the trend has moved away from large, clunky contraptions such as a Maglite, to smaller devices that easily fit in your pocket. 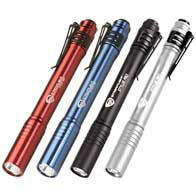 LED flashlights use less power, so you won’t be weighed down by the batteries. But they also provide bright light that can be focused on a specific area instead of illuminating a large area like a shop light does. There is a great deal of variation between lights, but the top flashlight will always be the one that can handle any job you have for it. Whether you’re laying on your creeper under the car, inspecting the exhaust system when your car’s on a garage lift, looking for a lost screw in your engine bay, or working with wiring under the dash, a small, portable light source is a necessity. 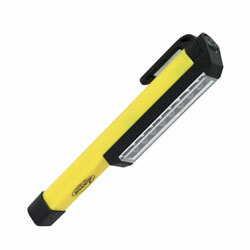 The Streamlight 66118 is the best penlight for mechanics in its class for several reasons. It weighs less than 2 ounces, and comes with a nylon holster for safe storage. Only slightly larger than a marking pen, the Stylus Pro is small enough to take anywhere, and with a maximum output of 65 lumens it will provide plenty of nighttime visibility or illuminate dark spaces under your car or inside a cabinet. It comes with one set of 2 AAA batteries, and each battery change will provide up to 6.25 hours of continuous use. It uses innovative technology to control the output, which makes the batteries last longer and provides a more dependable beam of light. On the other hand, this handy light is longer than necessary, so carrying it in your back pocket is risky since the end of the light or the nylon case could catch on corners and cause you to lose the light. It is not as tough as you might expect, and falling from a height of a couple of feet could potentially damage the light or the switch. With care and reasonable handling, it’s an incredibly useful flashlight for working on cars or around the house, even considering the minor complaints that are associated with it. The Stylus Pro is one of the most popular compact flashlights for mechanics and contractors. 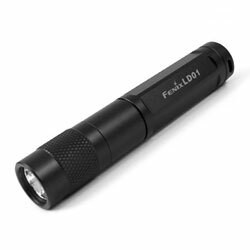 The Fenix LD01 is more compact than most LED lights, and provides an impressive maximum brightness of about 72 lumens with a single AAA battery. It has three distinct power levels, and the lowest level will provide continuous lighting for up to 27 hours. The lighting control is built into the flashlight head, and a simple twist will select each brightness level in succession. It is even designed to stand up by itself, providing emergency lighting in case of a power outage. Because of the power required to drive 72+ lumens of brightness, you can only expect about 1.5 hours of use on the highest setting, but that can be increased by using heavy duty lithium-ion batteries. It may not be a good idea to depend on the pocket clip, either, as it could be easily bent or broken, leaving you vulnerable to accidental loss. The Nebo work light is slightly fatter and longer than the Nebo, mostly because it uses 3 AAA batteries instead of one or two. The extra battery power means you will be able to get a sustained 60 lumens of brightness for a much longer period, and that is good news for campers, A/C technicians, and anyone who is constantly performing tasks inside a darkened room or space. As a general purpose light, this is one of the best mechanics flashlights you can get, and it casts a broader beam than you might expect from such a small profile. The magnetic clip is not as powerful as it could be, but it will hold the light in place as long as the surface it is attached to is stable and doesn’t rattle or shake while you are working. The On/Off switch seems a little stiff, but it can be operated with your thumb and does not wiggle even after months of usage. I used a streamlight for about 3years and it was a great light. I’d recommend it. Currently use a led maglite mini just because it fits in my tool belt better and I like the twist to illuminate feature and the twist to adjust the power of illumination. Streamlight was great flashlight though.